If you’re anything like me, you have quite a few books on your TBR pile. Personally, I have books here there and everywhere. And at last count, although not yet complete, I have about 100 books that have yet to be read. So, if I read one book a month it would take a minimum of 8 years to get through my TBR pile. But here’s the problem I keep buying books and therefore the TBR pile keeps growing. So for this bingo we are going to jump into our TBR piles feet first. This is a no pressure challenge. And if enough people sign up I’ll add some challenges, a Twitter chat and maybe a prize at the end. So sorry I’m so late for posting my progress for winter bingo I haven’t even reviewed the books I read yet been so busy. 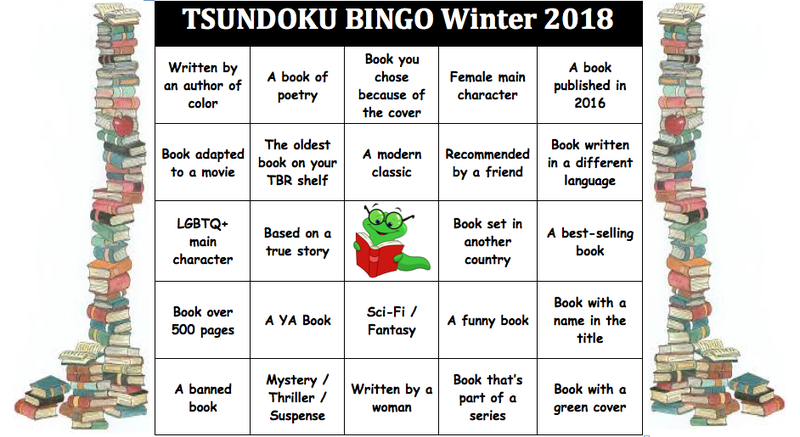 Anyway I read about 9 books for winter bingo and completed a line 💪😁 I will post my reviews and the link tonight and sure I will be joining the spring bingo. Hi Erica! I just discovered your blog but I’m loving it already! I’m a little late, but I’d like to join the Reading Challenge this year too! Hope you’re new year had a great start. Happy Reading! hey i really looking forward to this challenge..i dont have a blog but i have a bookstagram account which I have put the link of. I will definitely participate – it sounds super fun, and I have too many unread books on my shelves… and floor. I’m in! Not only will the challenge help whittle down my TBR list, it can also help my ‘decrease spending’ goal for 2018 by getting me to only read books that I already bought. This sounds like a great way to get through some of my HUGE TBR pile. I’m in! Glad you’re joining in. I look forward to seeing what you read. Glad your joining. I look forward to see what you’re reading. I’ll be participating! I’m really looking forward to doing this. I have a massive TBR that I need to make my way through. Glad you’re joining in. I look forward to see what you read.